Sharon Thompson is a Garden Writer and Master Gardener living in Chapin, South Carolina. She says, “I garden with the help of two dogs, two cats and a semi-retired husband who supplies occasional muscle power and frequent opinions.” She enjoys sharing her gardening experiences by speaking to garden clubs and writing for several Master Gardener newsletters, The State newspaper, Carolina Gardener Magazine, and Lake Murray-Columbia Magazine. Silver adds value to fashion accessories, dining utensils and retirement portfolios. It’s equally worthy in the garden where silver plants bring ruggedness as well as bling to the heat and glare of a summer day. Plants have evolved ways to cope with hot, dry conditions: tap roots that search for moisture deep in the soil, tiny hairs on leaf surfaces that disperse heat, reduced leaf surfaces to minimize moisture loss and blue-green or silvery leaf color that reflects heat. Beyond desirable physiological traits, silver plants also serve in a design capacity as color harmonizers. Pure white draws the eye, but gray or silver-toned foliage can connect one plot of complementary hues to another or bring peaceful co-existence to a clash of colors. While there are many silver-leaved plants, few are happy in our steamy South Carolina climate. When I was a new gardener, I quickly learned about the heartbreak of lamb’s ears. 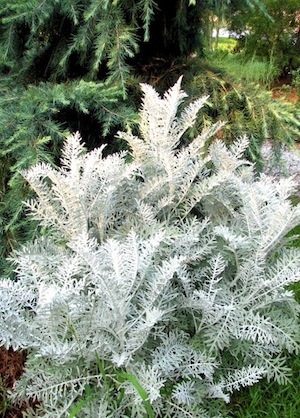 This quintessential silver plant with thick velvety leaves melts at the first sign of humidity; no amount of trimming of its declining foliage will rejuvenate it. A newer lamb’s ear, ‘Countess Helene Von Stein’ or ‘Big Ears,’ has fuzzy greenish-gray leaves but does not provide the silvery dazzle of its cousin. Artemisia ‘Powis Castle’ is a reliably non-invasive member of the herbal Artemisia family. Finely dissected, silvery leaves are born on a woody framework that can reach a foot tall and twice as wide. Happy to slave away in the sunniest and hottest of locations, ‘Powis Castle’ does not melt during a southern summer. Silver bachelor buttons, Centaurea gymnocarpa ‘Colchester White,’ doesn’t have much appeal in a nursery pot, but earns its space once it hits the ground. A dusty miller look-a-like, this plant boasts 6”- 8” inch gray-green leaves, heavily incised and covered with a thick mat of silver fuzz. Stems are swathed in fine, white, wooly hairs that beg to be touched. Growing to 2’high, its mounding habit can spread three feet wide. Attractive most of the year, I treat mine like a low growing shrub and let it cover the naked legs of neighboring plants. Purple, thistle-like blossoms, measuring about an inch across, appear in May on new growth. A little known sub-shrub, silver germander, Teucrium fruticans, should garner more attention than it does. Fine white hairs smother its thin, sturdy stems and the backsides of its small gray-green leaves. In late spring, light blue snapdragon-like blooms arrange themselves at the tips of its 3 foot frame. Equally at home in the ground or used as an anchor plant in a container, its airy silver structure marries well with other drought-tolerant plants. Look for it in the herb section of the garden center. All of these silver plants like well drained soil, good air circulation and a sunny situation. They also prefer a lean soil so leave the fertilizer on the shelf. Beware of over-watering: these are candidates for the hard-to-reach places in your landscape, not in front of a sprinkler head. 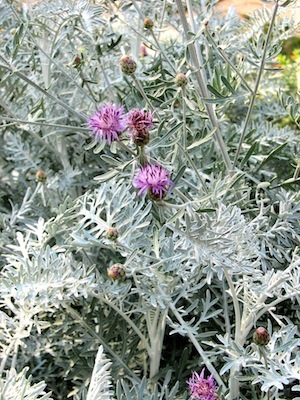 It is best to wait until spring to prune Artemisia and Centaurea. In winter, they can begin to look scraggly but delay pruning until you see signs of new growth along the lower parts of the stems. Then feel free to prune vigorously: new growth will cover up the stubby stems. Silver germander should be pruned after it blooms. Add these silver plants to your garden for a no-risk investment.